Locked in The Bratz's trip to the mall turns into a nightmare when they accidentally get locked in at closing time. The mall's a very quiet place at night-too quiet. But then they realize they can crank up the music, grab some eats and try on whatever they want...party time Maybe an overnight at the mall isn't such a bad thing. About Charles O'Connor (Author) : Charles O'Connor is a published author of children's books. 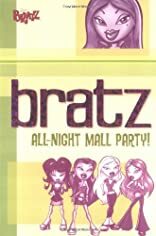 Published credits of Charles O'Connor include Bratz: All Night Mall Party (Bratz) and Bratz: Keepin' It Real (Bratz).